I have always enjoyed Halloween, who doesn’t love a chance to eat loads of candy and dress up? This year a girlfriend and me decided to decorate our own pumpkins. She decided to create a minion pumpkin and I of course went with a Tiffany blue one and attempted to paint a white bow on it (I never said I was an artist). After I was done I came across a few stories in my newsfeed about the “Teal Pumpkin” and decided to look into. Little did I know this color has a far more powerful purpose than looking cute. The Today Show posted a great article, click here to read its entirety. I am going to summarize the article below. 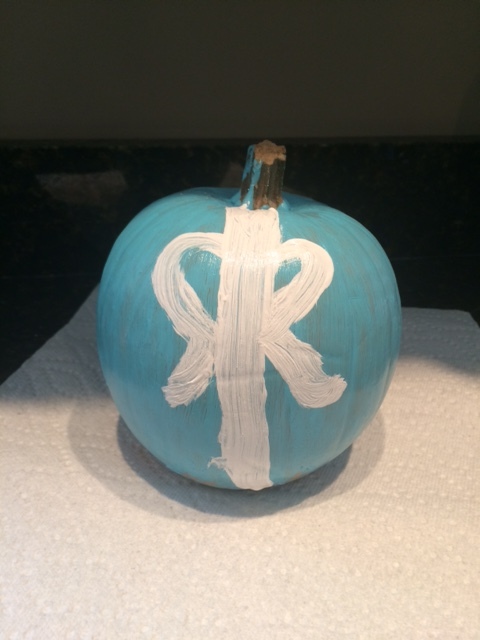 The Food Allergy Research and Education has created the Teal Pumpkin Project, which aims to make Halloween safe for everyone. This project helps to raise awareness of food allergies and when a house places a teal pumpkin outside it means they are providing non-food treats. Teal is the color for food-allergen awareness. I encourage you to consider offering non-food treats this Halloween and allowing all children to receive something fun in their goody bag.